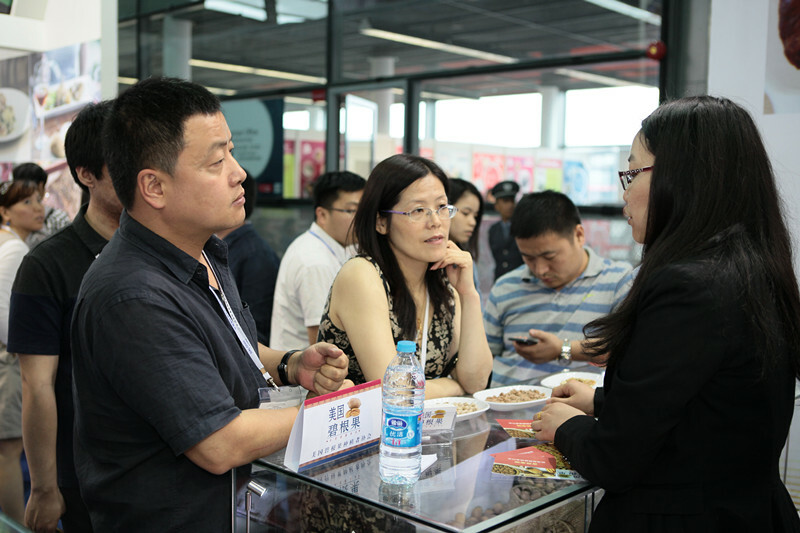 From 13-15 May 2014, attendees at the 2014 SIAL China show were drawn to the NPGC booth by the exciting chef demonstrations and free samples of Chinese and Western cuisine recipes featuring U.S. pecans. 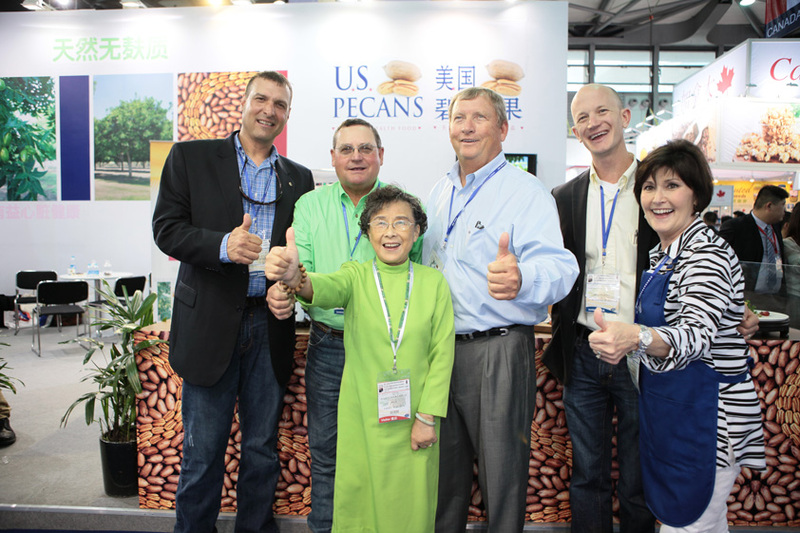 2014 marked the second year in which NPGC has hosted a U.S. Pecans booth at the SIAL China trade show. The U.S. Pecans large corner booth attracted significant attention from attendees who were drawn toward its colorful displays, samples of pecan products, and exciting chef demonstrations. Based upon visitor reactions, awareness of pecans had increased since the previous year’s exhibition. Nevertheless, some consumer-visitors were still unaware of pecans, initially mistaking them for walnuts. NPGC booth staff were on hand to introduce such consumers to pecans, offer various pecan samples, and provide literature on the unique health benefits of pecans. Throughout the three-day show, the U.S. Pecans booth was also a popular gathering point for major nut importers and food industry professionals that were interested in learning more about pecan varieties, prices, and product forms. They had the opportunity to speak directly with five pecan growers and exporters that had traveled all the way from various regions of the U.S. to promote their pecans and learn about their target market in China. Several times during each day of the show, six recipes and two desserts featuring U.S. pecans were demonstrated by the NPGC consulting chef. The chef demonstrations attracted large crowds of Chinese consumers that were dazzled by the dishes’ presentations and intrigued by the creative use of pecans in familiar dishes such as fried rice. On the second day of the show, the U.S. Pecans booth was visited by Tudou.com, China’s earliest and most influential video sharing website. Interviews were conducted on video with Randy Hudson and Janice Dees of the Georgia Pecan Growers Association, and Keith Schneller, Director of ATO Shanghai. During the show, Mr. Randy Hudson and Janice Dees held meetings with major nut importers from Zhejiang and Guangzhou, as well as a key association overseeing China's standards for imported nuts. The 2014 edition of SIAL China represented the show’s 15th year and achieved a record 45,000 professional visitors and 2,400 exhibitors from 90 countries and regions. On the evening of May 14th, ATO Shanghai hosted a trade reception at the Wyndham hotel for USA pavilion exhibitors at which U.S. Pecans received additional exposure. In the gathering area outside the reception hall, NPGC hosted a table featuring U.S. Pecans literature and samples which were popular among the USA pavilion exhibitors and VIP Chinese attendees, most of which came from major trading companies, retail chains, and e-commerce websites.